CARICOM Secretariat, Turkeyen, Greater Georgetown, Guyana - The ability of men and women to participate equally and equitably in all aspects of life under the CSME must be ensured. 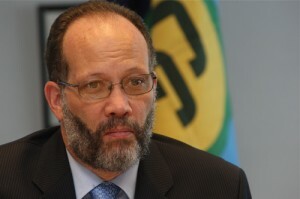 Those were sentiments expressed by Secretary General of the Caribbean Community Ambassador Irwin LaRocque on Wednesday as he addressed the opening ceremony for the Twenty-Sixth Meeting of the Council for Human and Social Development (COHSOD) which is being held at the CARICOM Headquarters in Georgetown, Guyana. The two-day meeting of COHSOD brings together Ministers with responsibility for Labor, Gender and Social Development from across the Region as well as representatives of regional institutions, and regional labour and private sector bodies. “The recommendations of this Meeting, based on the study on the Gender Impact of the CSME, undertaken under the Canadian-funded CARICOM Trade and Competitiveness Project will be crucial to advancing gender equality in this regard” noted the Secretary General. Speaking to the issue of youth development, Ambassador LaRocque encouraged the delegates to recognize an imperative to engage youth in ways that will utilize their creativity to contribute to their own development and prospects of employment. The Secretary General noted that there have been numerous opportunities provided for youth within the Information Communication Technologies Sector. He said ICT was opening up new vistas and the Community needs to be well placed to fulfill the potential it offers for employment and entrepreneurship. “Your Agenda reflects the importance of ICT in helping to achieve a key social and economic goal – decent work” Ambassador LaRocque said. He further stated that Decent Work is an important focus for the Council, given its central role in alleviating poverty. He also urged delegates to ensure that human capacity development within CARICOM is relevant to societal needs in the context of the draft strategic plan. He said the Strategic plan was in the process of being finalized to be presented to the Conference of Heads of Government at its Thirty-Fifth Meeting in July.